This article provides a brief history of participatory design and an overview of its principles, followed by a discussion of participatory design as an apt methodology for building a more justice-oriented library. To illustrate the practice of participatory design, the article includes an in-depth description of a participatory design case study in which Native American students and a librarian co-created a new community outreach tool for a library at mid-sized public research university. The article concludes with recommendations for library practitioners who wish to implement participatory design practices with Indigenous communities. This paper explores participatory processes for bringing diverse user groups into the design and development of learning ecosystems. It draws on the case study of the Library for Food Sovereignty, a project working to create a local knowledge commons for smallholder farmers in East Africa. Using participatory technology development methodologies as a framework to build upon, I discuss opportunities for integrating the critical perspectives of user groups into the design process. This development methodology is primarily used in agricultural extension, but its principles are increasingly valued across fields. Central to the approach is the belief that we can improve the health of the whole system by working with the uniqueness of places and the people that inhabit them. Crucially this includes valuing and leveraging the perspectives and unique attributes of communities. Libraries that are starting to explore processes and approaches to improving the information ecosystem—especially libraries with diverse patron groups—can learn a lot from the Library for Food Sovereignty case study. The processes explored in this paper can help create library information ecosystems that are not only meeting the unique needs of diverse patrons but are also transforming the learning process. We present a creative method for applying the UX technique of journey mapping to improve the onboarding experience of new employees in any organization. Journey mapping is a well-known design research tool used to gain insight into how a user experiences a service, process, or product, with the goal of making informed improvements to deliver a better experience for future users. We argue that journey mapping can also be used to improve the internal process of onboarding new employees and improve the experience for future new hires, which is important because positive onboarding experiences are linked to increased productivity and greater employee retention. 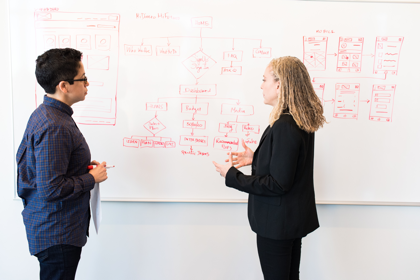 We share how other organizations can use journey mapping to improve the onboarding process utilizing our employee experience journey mapping project toolkit (Frank & McKelvey, 2017) designed to help guide similar projects, complete with shareable templates. In addition, we share the methods used at our library, as well as our findings, recommendations, and lessons learned. Prior to the launch of the new Primo user interface in the summer of 2018, the University of Haifa conducted a usability study that aimed to determine whether users' information needs were met in a timely, convenient, and pleasant manner, the problems they encountered, and the changes necessary to meet their needs and improve their overall library experience. In order to remain relevant to its users, the library's discovery tool, as well as its services and physical conditions, must continue to make a significant contribution to the student and faculty learning and research processes.